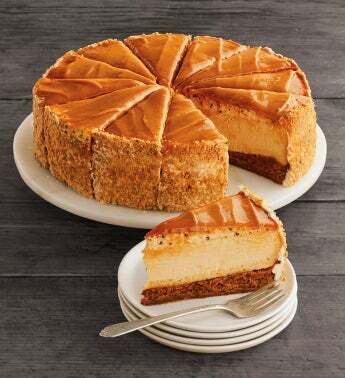 The Salted Caramel Cheesecake from The Cheesecake Factory® combines the elegance of caramel and cheesecake with the smooth texture of creamy caramel mousse and a chewy blonde brownie. Topped with sweet and savory salted caramel, it's the perfect dessert for any occasion, be it dressed up or dressed down. Enjoying this cheesecake is a deliciously refined way to celebrate.